Dairy farms have changed a lot since Grandma's day but much remains the same. Come and tour our dairy farm where we milk 105 Jersey cows with 105 young stock. This is an average size farm to support itself in today's economy. You may even get to see a birth or name a calf! Enjoy our border collie, 5 cats and 14 chickens who supply the eggs for breakfast! We enjoy meeting our guests and they like the inviting atmosphere. You will stay in one of two cottages that is private and comfortable located adjacent to the farm in a wooded area. Each cottage sleeps 5 adults and a crib is available. 4 ft. showers a/c and heat, a kitchenette includes refrigerator, microwave, and sink. 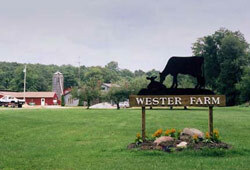 Have a memorable vacation and join us at the Wester Farm Bed and Breakfast.